On April 20, 2006, Sean Simonson, a City of Milpitas firefighter, flew over the handlebars of his mountain bike and landed on his head. Sean’s accident injured his spinal cord and changed his life forever when he became a quadriplegic (someone with limited or no movement in their arms and legs). Initially, doctors believed that Sean would not regain any of his lost movement, which meant he would only be capable of moving his left arm leaving Sean bed ridden for the rest of his life. Sean proved the doctors wrong and immediately began planning his return to the fire department and competitive sports. 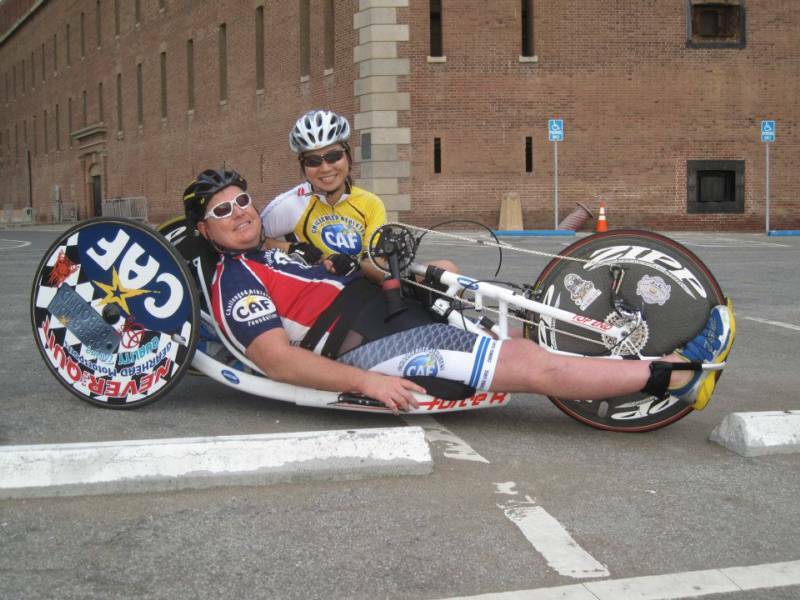 In 2006 while training for a distance ride, Sean had his accident that injured his spinal cord. While at Stanford Medical Center, doctors told Sean that he would need around the clock home health care for the rest of his life. Instead of accepting their diagnosis Sean focused on his rehabilitation so that he could return to the fire department. Sean spent 70 days in the Santa Clara Valley Medical Center in spinal rehabilitation facility. Physical therapy taught Sean to do daily activities with his limited motor skills. Eleven months after the accident, Sean returned to the Milpitas Fire Department as the Manager of the Office of Emergency Services. Today Sean works as the City of Milpitas’ Emergency Preparedness Manager where he is responsible for the safety of all 600 employees and the community at large. Sean’s situation taught him that being a firefighter doesn’t just mean running into burning buildings, but it means that you have an innate desire to help people and be a part of a team. Sean currently trains and races on his hand cycle, racing wheelchair and in the swimming pool. He regularly competes in marathons and triathlons. Sean competed in this summer’s Firefighter Olympics where he won a gold medal in Triathlon and Cycling. During Sean’s rehabilitation he received support from the California Association of Professional Firefighters (CAPF) Long Term Disability (LTD) Plan and the NPFBA Long Term Care (LTC) Plan. The CAPF Long Term Disability (LTD) Plan protected Sean’s salary during the eleven months he was off work. The NPFBA Long Term Care (LTC) Plan has covered Sean’s care expenses for 5 years and will continue to cover care expenses for the rest of Sean’s life.